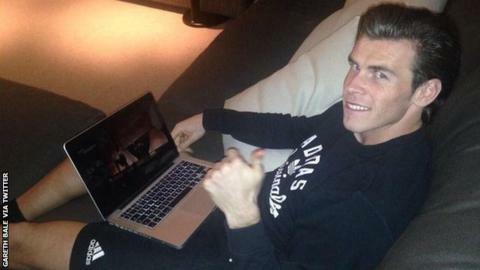 Real Madrid and Wales football star Gareth Bale was among those watching our live stream of the BBC Cymru Wales Sports Personality. Bale was nominated for the award, which was won by his former Cardiff schoolmate Geraint Thomas. Bale tweeted: "Congratulations @GeraintThomas86 !! Great to see a fellow Whitchurch High School pupil win #WSA2014." You can watch the awards ceremony again via iPlayer. Bale was relaxing ahead for his Spanish club side's Champions League game against Bulgaria's PFC Ludogorets Razgrad on Tuesday, 9 December. Team Sky rider Thomas won the public vote just ahead of second-placed gymnast Frankie Jones and mountain biker Manon Carpenter in third. The 2013 award was won by rugby union star Leigh Halfpenny.